I had been a Buddhist for many years before I met Ajahn Chah. I had tremendous interest and faith in Buddhism, as well as an eagerness to study and practice it. But it was still coming from the sense of my doing it, my studying it, my trying to practice it. When I became a monk, there was still this tendency: “I want to get rid of suffering. I want to be enlightened.” I was not much concerned about other people, about my parents, or even about Ajahn Chah, with whom I was living at the time. I thought that it was very nice that he was helpful to me, but I did not feel a deep gratitude. I had the idea that life owed all this to me—an unpleasant kind of conceit. When we are brought up in middle-class comfort as I had been, we take so much for granted. My parents worked hard to make my life comfortable, but I thought that they should have worked harder, and that I deserved more than what they gave me. Even though this was not a conscious thought, there was the underlying attitude that I deserved all I had: people should give me these things; my parents should make my life as good as possible, as I wanted it to be. So from that viewpoint, it was Ajahn Chah’s duty to teach and guide me! His memories reminded me of myself at that age. Growing up in the “counter culture” of the 1960’s there was a subculturally approved logic to my ingratitude. I was suffering, therefore I was a victim. Who was to blame? The psychology of the times pointed first to my parents. Their ineptitude and neglect created deficits which made my life harder. And then there was the larger society, which was seen as oppressing people and eroding their souls. Thankfully, over the years since my twenties and early thirties my capacity for gratitude has increased (as has Ajahn Sumedho’s). The primary change agents included being a father and husband, living for several years in Communist Romania during the 1970s and early 80s, and, for the past several decades, being a student and practitioner of mindfulness. 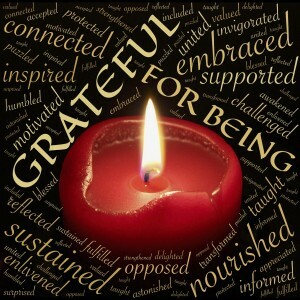 Gratitude … is an uncanny and positive attitude of appreciation or thankfulness in acknowledging a benefit that one has received or will receive from others. It is often accompanied by a wish to thank them, or to reciprocate in kind, thinking: This wasn’t achieved by me alone, but by the help and support of this and that good person. This Thursday evening, after our meditation period, we will focus our Dharma sharing on how we experience and offer gratitude. We will begin with an exercise recommended by Thich Nhat Hanh in which we identify a feeling of gratitude, immerse ourselves in the feeling, and then record our insights. A description of the exercise is below. You are invited to join us on Thursday, or to practice this exercise on your own. There are moments when we feel very grateful for the other person in our life. We deeply appreciate his or her presence. We are full of compassion, gratitude, and love. We have experienced moments like this in our life. We feel so grateful that the other person is still alive, that she is still with us, and has stood by our side during very difficult times. I would suggest that if such a moment happens again, take advantage of it. To truly profit from this time, withdraw to a place where you can be alone with yourself. Don’t just go to the other person and say. “I’m grateful you are there.” That is not enough. You can do this later. Right at that moment, it is better to withdraw into your room or to a quiet place, and immerse yourself in that feeling of gratitude. Then write down your feelings, your gratitude, your happiness. In half a page or one page, do your best to express yourself in writing, or record yourself on tape. This moment of gratitude is a moment of enlightenment, of mindfulness, of intelligence. It is a manifestation from the depths of your consciousness. You have this understanding and insight in you. But when you get angry, your gratitude and love do not seem to be there at all. You feel as if they have never existed, so you have to write them down on a sheet of paper and keep it safely. From time to time, take it out and read it again.